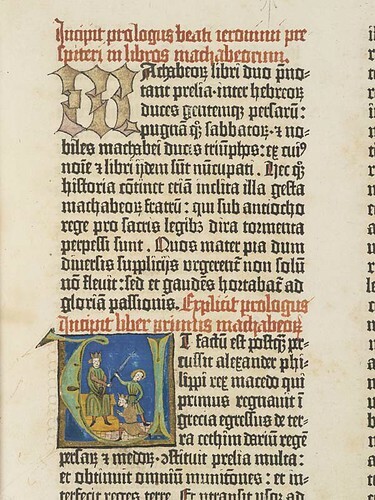 The Gutenberg Bible was the first book printed with moveable type. 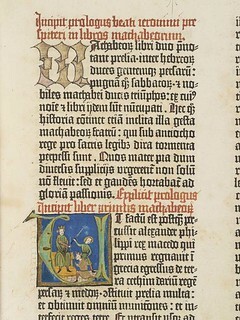 Printed in Mainz, Germany, around 1455 by Johannes Gutenberg, the inventor of printing, and Johannes Fust. One of around only 20 complete copies to survive out of the original 180. Two volumes. Also known as The 42-line Bible or The Mazarine Bible. A page from the Old Testament from the chapter I Maccabees, contains handwritten red rubrics. Decorated initial M; historiated initial U (the correct initial should be E) depicting King Alexander hitting King Philip of Macedony. The Greeks under Alexander had conquered Judea. Marginalia visible but faded through washing.